Staff from Sainsbury's in Dronfield, along with representatives from Chesterfield Guide Dogs branch, visited Guide Dogs Training School in Leamington to see the progress their sponsored Guide Dog puppy Dawson is making in his training to be a Guide Dog. The staff at Sainsbury's have been following the progress of Dawson since he was 6 weeks old (as we reported HERE) and have heard all about his progress over the last few months since they raised £10,000 to choose his name and sponsor his basic Guide Dog training. Jo Brougham of Sainsbury's says: "It was really exciting to meet Dawson again. It was also great to meet his Guide Dog Trainer and to find out all about the training and what his personality is like. "These little things bring us closer to the whole process and it's fascinating. 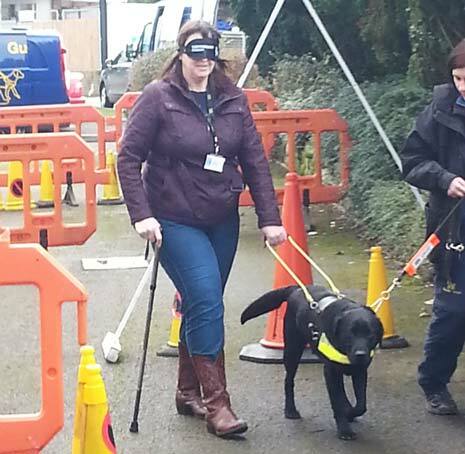 We even got to have a blindfold walk with Dawson which was amazing; he is a very special boy!" Jo Berry from Guide Dogs, says: "Puppy visits are really special. People then get to see that all the time and effort they put into fundraising has borne fruit in the training of this dog. It makes it all worthwhile." It costs just under £50,000 to support a Guide Dog partnership from the birth of the pup to its retirement aged about 10. Guide Dogs does not receive any Government funding for this service. Without the generosity of public donation, they would be unable to support the 4,600 Guide Dog partnerships in the UK.